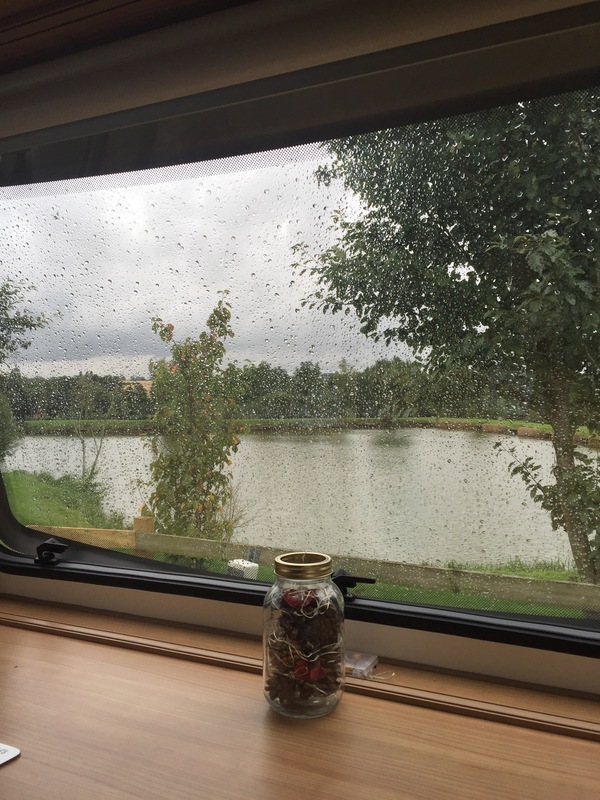 Arrived on site at Makins Fishery near Nuneaton, just as the heavens opened with biblical force. Pitched up very quickly, nose on to a beautiful fishing lake. Beautiful even in a downpour. The rain continued throughout the day and into the evening. Noah, a fisherman down on the banks started playing with wood as wild birds formed an orderly queue, two by two. Rain continued to hammer on the roof throughout the night. Blinds opened to reveal a dull grey November day, not good really as it’s only the first week in August. Where has our summer gone? Plans for a brunch cooked on the Cadac abandoned, halogen oven provided sausage barms instead. We’re here, outside Nuneaton for a reason. We’ve bought a monster of an awning from a particular ‘pre-owned’ website, no picture, we don’t even know the colour, just that it’s an Isabella and it fits our large caravan. The Boss has had a few text messages with ‘Maggie’, the seller, and says his gut feeling is “It will be fine”. We are hopefully putting it up to check it out later this week, if the rain decides to go get another county wet. A few years ago we traced our family trees back. We traced my family back to the reign of Henry VIII and they lived in North Bolton five minutes from my parents current house. 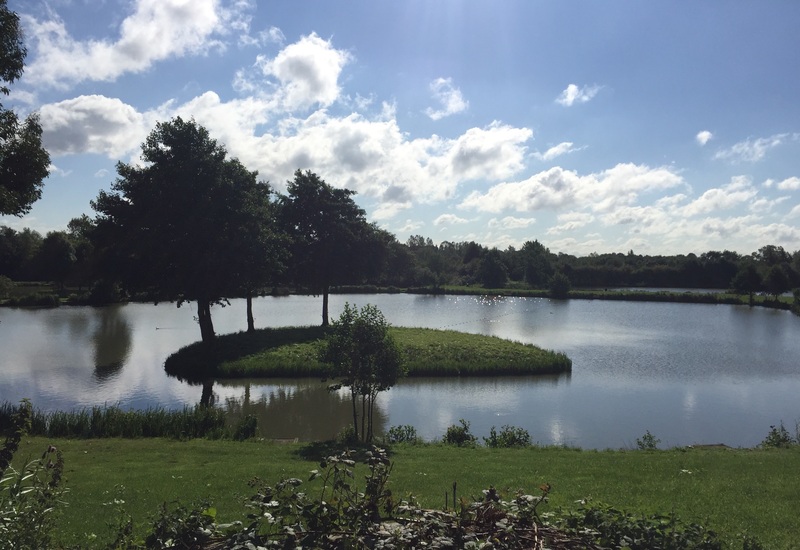 We then traced The Boss’ paternal line back to Leire, near Lutterworth, Leicestershire, where they were quite an influential family, oh how things change! 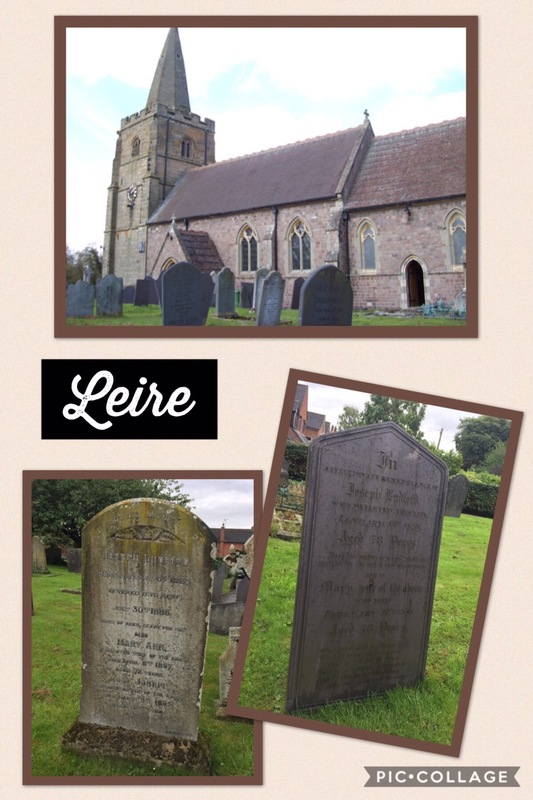 Having visited Leire, in the past and been walked around by a local historian, we decided whilst we were just five miles down the road we’d pop along and visit the dead relatives. The rain clouds parted as we stepped out of the car for a quick visit to the graves and a walk around the village. Last time we were here we stopped for lunch in one of the village pubs. We remember it being quite countrified, it now bears a new name and swish modern decore, The Crab and Cow. Nice pub, very quiet, not surprising really, local brew had run out and they were awaiting a delivery, fleeced for £8 for two not so big bottles of Brew Dog Ale we sought the comfort of a settee near the door and savoured our liquid refreshment. Every penny of our beer savoured we head towards Coventry. The Boss wanted to visit the Coventry Music Museum and 2-Tone City. A throwback to his youth, he was a mod listening to The Jam, The Beat, The Specials, I was more of a rocker with Rush and Led Zeppelin in my record collection. A quick google search before we came out informed us it was only open Thursday to Sunday, today was Wednesday, gutted, dooohh, we even drive past the building with large 2-Tone flag flying outside to remind him what he wasn’t going to see. Next, to find a car park in Coventry, we passed dozens, either full or ‘students only’, some better signage would probably reduce a few tonnes of carbon emissions not to mention getting confused visitors off the City Centre roads. Eventually we find a multi-storey car park and dump the car. 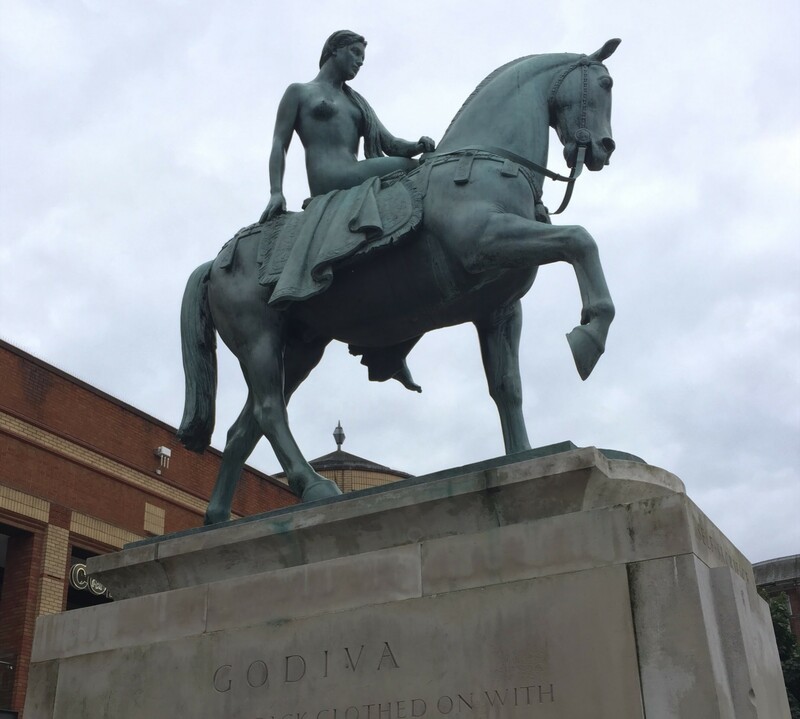 City Centres can be a bit ‘hit & miss’ with us. We are not too good at parting with money, so generally, we like an impressive Cathedral, a good free attraction and somewhere to feed our faces. 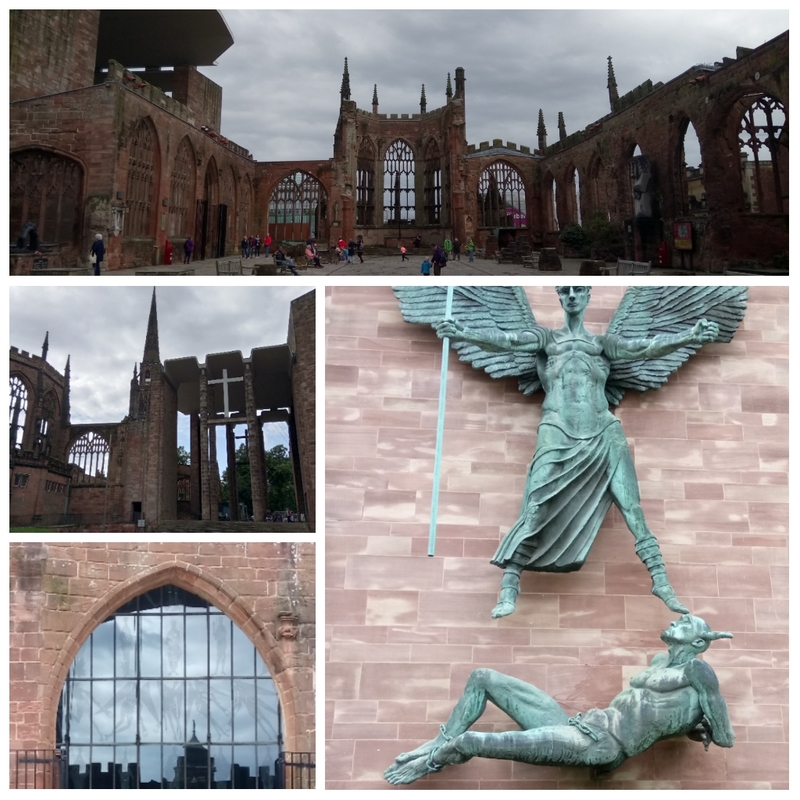 Coventry definitely has an impressive Cathedral, or more precisely, what is left of it after World War II bombing raids, we expected a ruin, but as ruins go, this one has a completeness that defines it’s moment in history, badly described, sorry, you need to see it to understand. 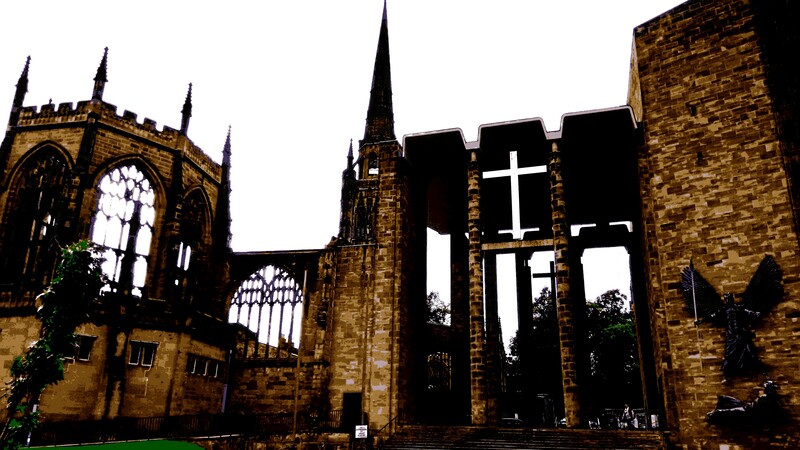 The ultra modern Cathedral built next door contrasts perfectly and architecturally holds hands with its predecessor. Two minutes away is the free attraction, The Coventry Transport Museum, once again he is getting me into a museum by stealth, I think we are looking for a shop for tonight’s wine until we are standing at the doors of a swish looking building, not a supermarket. “It’s free” he says, as if that will make it more interesting. Well … cough … it was actually OK, the collection of vehicles in the museum is enormous from the very first ‘boneshaker’ bicycle to the jet propelled land speed beasts of today. Luckily, he only thinks a car works by turning the key, so much to my relief does not read all the plaques and ‘bumf’ about each exhibit. 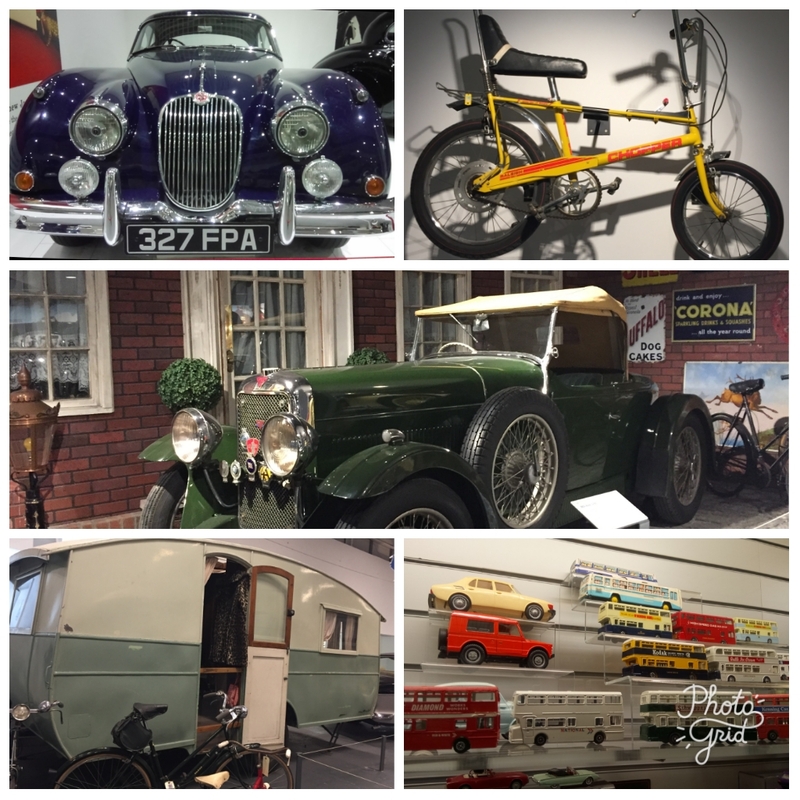 A genuinely impressive museum for people of all interests, we did feel our ages however when we noted the glass displays full of the toys of our childhood. The museum ends with a ‘Picket Line’ to represent the industrial disputes of the early 1980s, as you walk through a voice shouts “Scum” for crossing the line, interestingly, there is a diversion route to avoid this, a nice touch, you know some people could never bring themselves to cross a picket line. We close the day with tea (evening meal) at Wagamamas, the only meal that takes us longer than five minutes to eat, mostly due to our terrible command of the humble chopstick, blimin’ good though. 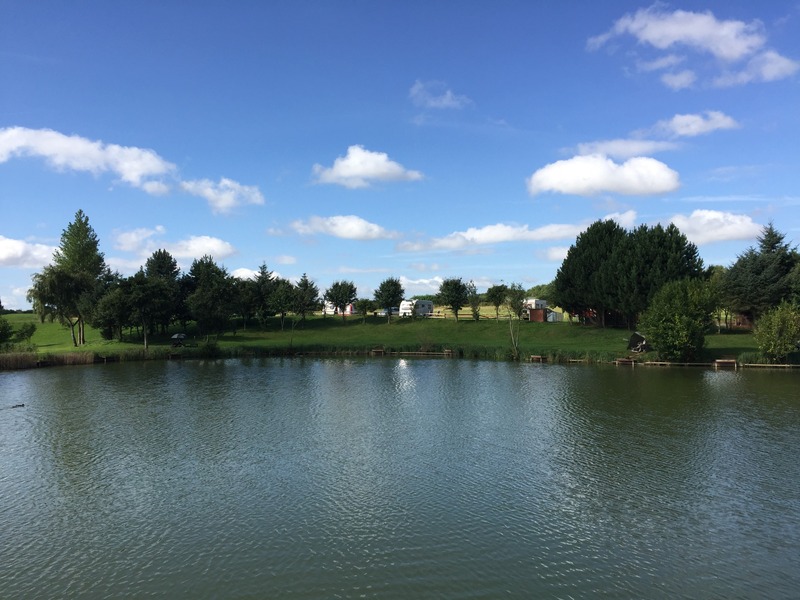 We awake on Thursday to wall to wall sunshine, a quick walk around the site taking lots of pictures, so we can convince Facebook world that we had a lovely few days. We omitted the half built Ark from the pictures. Today was ‘Awning Day’, our seller suggested this site so knew where to find us, we send a text “we are the caravan with no awning” which wins most obvious text of the month award. Maggie and Keith arrive looking a little concerned, “This is way too big for your caravan”. We are worried now, a long way to travel for no awning. Google checked the vital statistics of their van / our van and we decided to just go for it. In return for a cup of tea and a chocolate biscuit Keith was now about to spend his day erecting a 24ft awning that Maggie only informed him had sold the previous day, Maggie and I did shout the occasional words of encouragement as the two men looked at poles, canvas and clamps whilst scratching their heads. The good news, it fitted our caravan perfectly, oh, and it is shades of blue, somewhere under the mud. We were fully aware of the ‘mud’ pre-purchase as it had last been used on a seasonal French pitch. 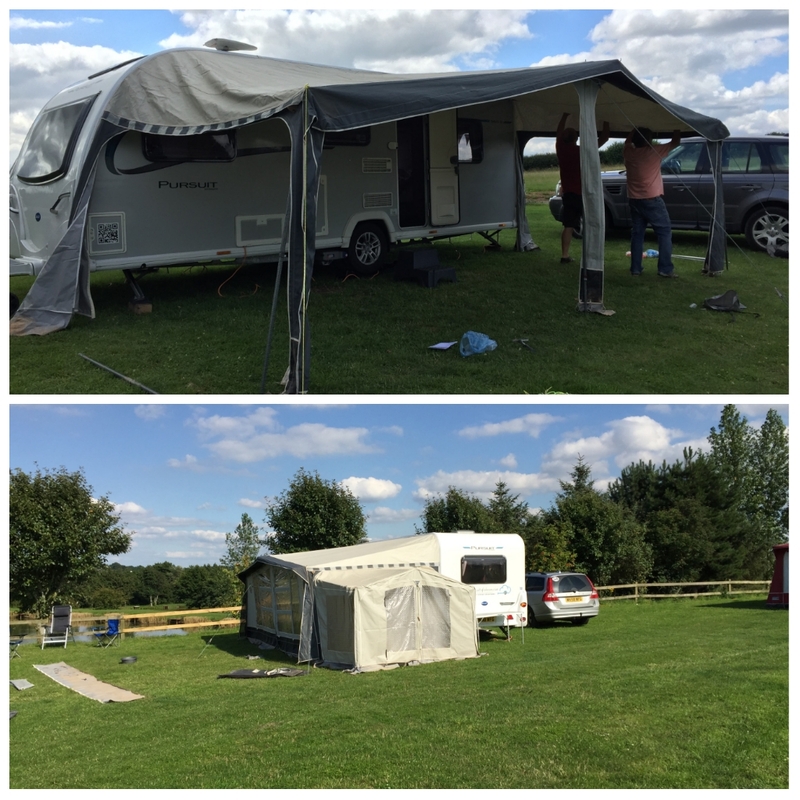 If they were happy to help erect the awning on a ‘no like no buy’ basis then we were more than happy to clean it. The awning is massive, then following a trip back to their house for some bits and pieces an additional ‘annex’ was provided, even bigger, a bonus. It was a pleasure to do business with Maggie and Keith who really went the extra mile to ensure we were happy, but if you are reading Maggie, blimey, that mud was welded to the skirts!! More of a cottage than a caravan, now! Enjoy! Lovely post, as all of them are! Thanks for sharing. Cottage? It felt like a large bungalow!